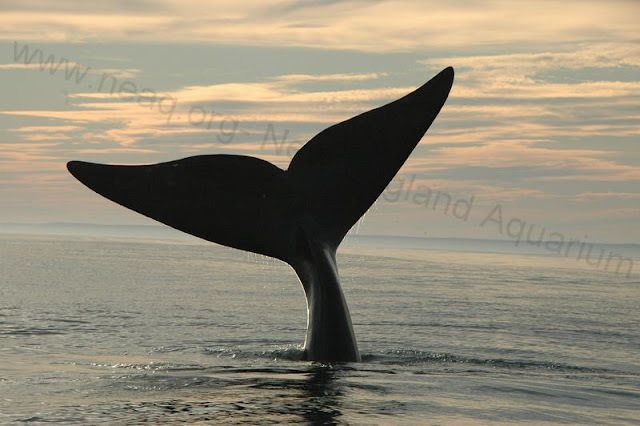 #19: Finding Porcia in the Bay of Fundy - Get some whale wallpaper for your phone! On September 9, both the R/V Nereid and R/V Callisto headed out into the Bay of Fundy. It was a slightly unusual survey day- we had a late start due to thick fog, so we didn't even photograph our first whale until 1:30 PM. Though we could hear the whales--their strong exhalations reveal their location--they were difficult to see because of a strong swell that obscured our view of them. After a long afternoon of difficult sightings, the Callisto crew and I were excited to sight a mother and calf pair. Looking through the camera lens, I noticed the mother had a distinct convex head shape we call a "roman nose." A bell went off in my head- earlier in the morning, Monica had told me that the only calf present in the Bay that still needed to be biopsy darted was the calf of #3293. #3293 is named Porcia, one of the most famous Roman women. The calf's callosity was continuous, another clue that this was Porcia's calf. We called the Nereid and informed them of who we thought the whales were. Shortly thereafter, the Nereid arrived, confirmed that the calf was Porcia's, and Monica collected a biopsy sample from it! We were all excited to be one step closer to having collected genetic data for each of the 21 calves born this year. We believe that Porcia was born in 2001, although we aren't completely sure of this. Her first calf was born in 2008, and is still doing well--it was last sighted in Cape Cod Bay this spring! We observed Porcia with her 2011 calf for a while longer, but before they disappeared into the sunset, Porcia went on a memorable dive--she paused with her flukes held high in the air for several seconds before completely slipping under the surface, which allowed me to take this photograph. Download a version of this image as wallpaper for your smartphone! Porcia's perfectly black, unscarred flukes are a rare sight in a population where over 70% of the individuals have been left with white scars after being entangled in fishing gear.